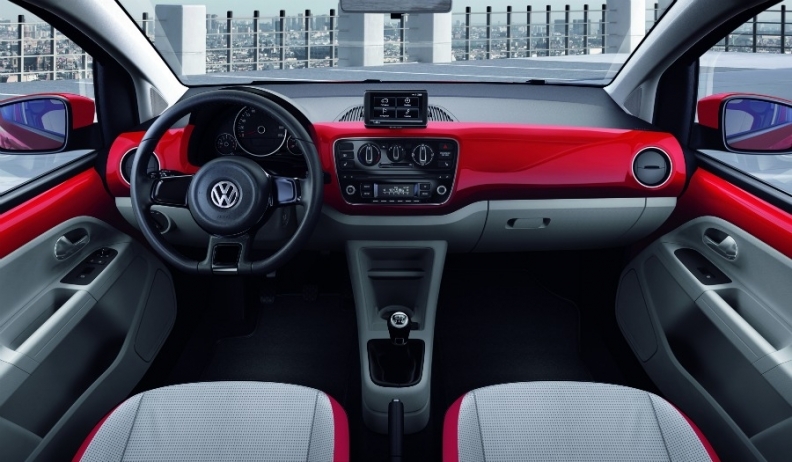 Volkswagen has released pictures and details of its new Up minicar that will take aim at rivals such as the Fiat Panda, Renault Twingo and Peugeot 107 in Europe's popular minicar segment. The Up will be offered with a new fuel-efficient gasoline engine and safety technology that is a first for the segment, VW said in a statement released on Sunday. The four-seat car will be unveiled Sept. 12 at the Frankfurt auto show and will go on sale in Europe in December. The Up will cost about 9,500 euros ($13,600), said a person familiar with the product who declined to be identified because the price has not yet been officially announced. The Up is strategically important for VW as Europe's biggest automaker aims to pass Toyota Motor Corp. and General Motors Co. to become the world's biggest automaker by 2018. The car will replace VW's slow-selling Fox in Europe and tap growing demand for small, fuel-efficient vehicles in Europe and in emerging markets. The Up's clean interior layout includes a portable navigation unit on the dashboard. 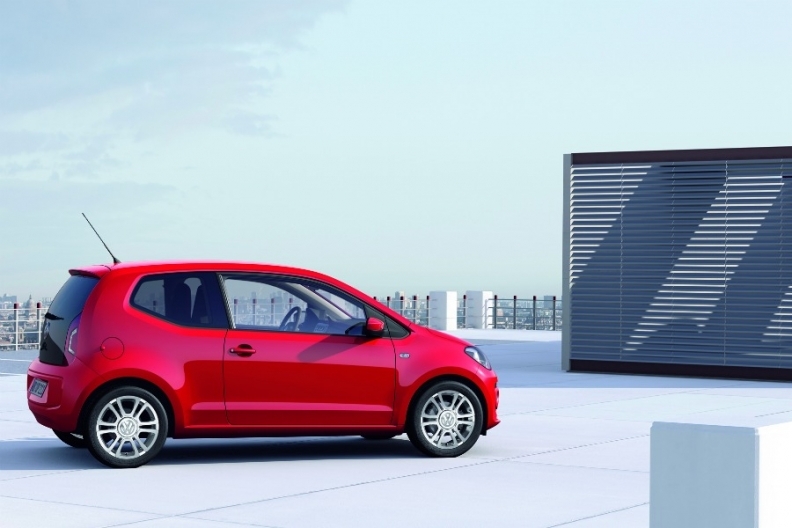 The Up is the first model in VW's new entry-level lineup. In the coming years a range of cars, grouped under the label New Small Family, will be introduced, from a coupe to a minivan. A decontented variant is planned for emerging markets and VW's sister brands Skoda and Seat will get their own versions. In Europe's crowded minicar segment, Volkswagen hopes the Up will stand out because of its pragmatic design and modern comfort and safety extras. 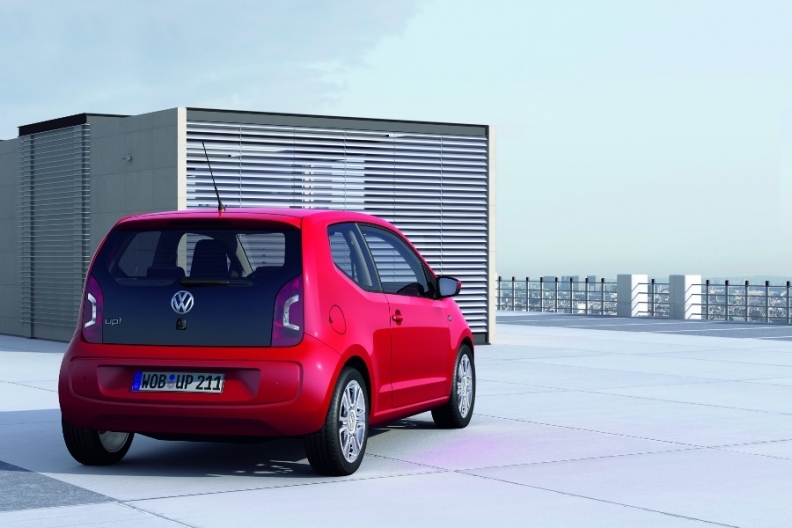 VW says the Up is the first small car to be offered with a system that automatically applies the brakes at speeds under 30 km/h (18 mph) if a laser sensor detects the risk of an imminent collision. The Up also has a portable infotainment device developed with Navigon, a navigation systems supplier. The touchscreen gadget looks like a smart phone and snaps into place on the dashboard. It serves as a central display screen and control unit for the navigation, onboard computer, telephone and audio equipment. The car also will be offered with a new generation 1.0-liter, three-cylinder gasoline engine with 60 hp and 75 hp ratings. The most fuel-efficient 60 hp version with stop-start will use 4.2 liters of fuel per 100km. The most fuel-efficient 75 hp version will use 4.3l/100km. Both have CO2 emissions of less than 100g/km. A natural gas engine will follow and an Up with an electric drive will launch in 2013. 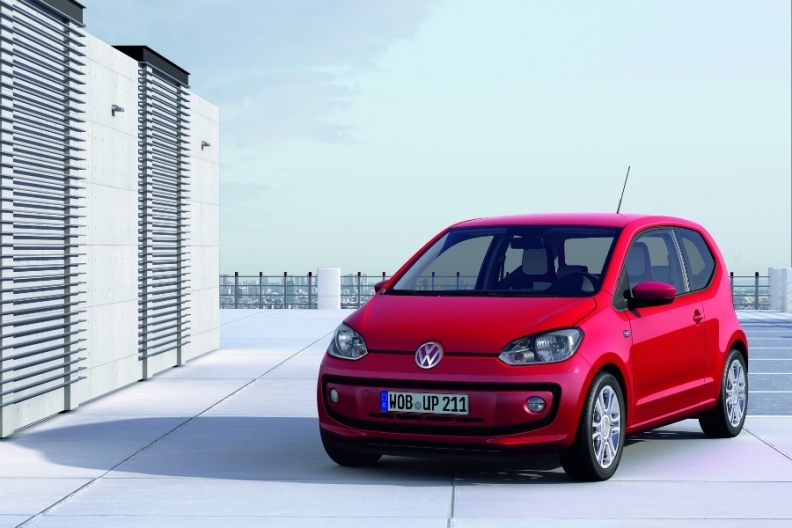 VW said the Up will be sold in Europe with three different versions for different budgets and needs. "Take Up" is the entry-level car, "Move Up," a version with more comfort features and "High Up" is the top-end variant. VW says the Up's long wheelbase at 2420mm, combined with an engine that is mounted well forward, gives it a spacious interior for its segment. A battery-powered Up is planned. The Up's 251 liters of trunk space, rising to 951 liters with the rears seats folded flat, is large for the segment. The Up is 3540mm long, 1640mm wide and 1480mm tall. As a marketing gimmick, the Up will be offered with small, lightweight boxes for a wide variety of situations and needs. A "kid box " is designed for parents with young children and includes a bag for small children's items such as cuddly toys and lunch boxes. Other Up boxes will be called a "city box" and a "travel box." VW needs the Up to be more successful than the Brazil-built Fox. European sales of the Fox were down 56.4 percent to 8,050 in the first half, according to JATO Dynamics. Segment leader, the Fiat Panda, had a sales decline of 22 percent to 109,410. The Up will be built in VW's factory in Bratislava, Slovakia. The Up, shown, replaces the slow-selling Fox. "It's a valuable addition to VW's broad product portfolio," said Tim Schuldt, a Frankfurt-based analyst at Equinet AG. "Small vehicles are becoming ever more important. The Up will create a whole new model line with good potential to penetrate markets."